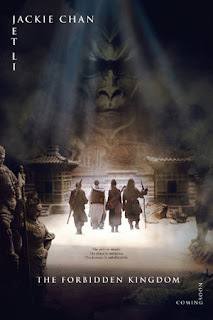 This is the first time in movie history that martial artist Jackie Chan(Drunken Immortal) and Jet Li(King Monkey/Silent Monk) where in the same movie. Yeah! the movie is great, I do like Jackie Chan movies. The forbidden kingdom is about a King that has a powerful spear, that no one can defeat him even many soldiers fight, but one battle made him a prisoner, because he was trick by the leader of tha jade army. He threw his spear to the sky so that the leader of the jade army will not have it. Then, the search begin for the spear. The movie is full of great actions and comedy, I enjoyed watching the movie event he theaters a full, we fall in line just to see the movie. Our sweat in falling in line was worth it. So, if you haven't watch the movie, decide now and Watch it!!! In the news on TV, the first day of the movie earns 23 million dollars. I never see this movie, yet i would like to rent. i check it out. Seem like a good movie. I like jackie chan too.